Drigung Thil Monastery is a site of great religious and political importance in Tibet. It is also widely known for its sky burial ceremony. Situated at an altitude of 4465m, it overlooks the Shorong valley, making it an excellent viewpoint for visitors interested in the landscape. This is one of the remote travel destinations in Tibet which is not far from Lhasa, and you can extend here and combine lots of off the beaten path Tibet travel experiences. Drigung Thil Monastery was built in 1179. 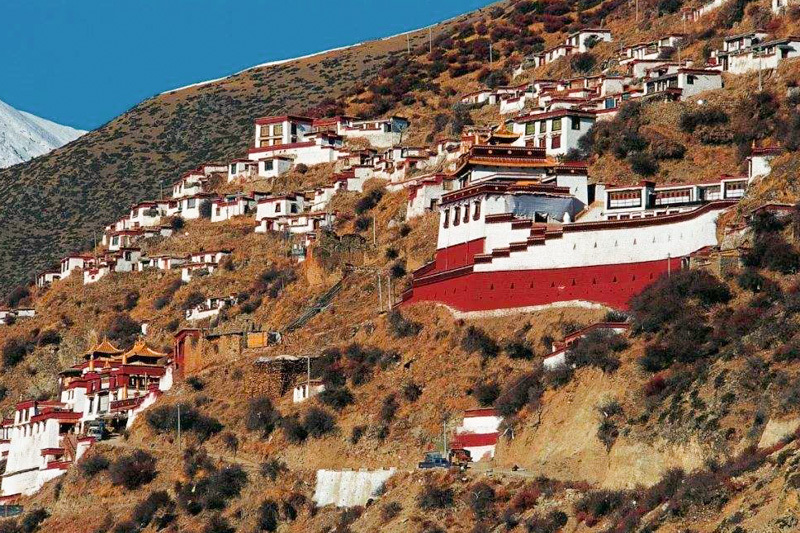 Throughout the history, the monastery has played a crucial role in Sino-Tibetan relations. The name of the monastery bears great association with yak. Therefore, there are still yak horns inside the monastery. Built on a steep cliff, it is currently home to around 250 resident monks, where they do meditative studies. The monastery consists of more than fifty buildings. The mail shrine hall Tsuglakhang stands a staggering 20 meters high. It is where monks receive their lessons. You can find many statues and stupas inside the shrine room, including image of the founder Jigten Sumgon. Other buildings are accessible by steep staircases. A pilgrimage kora starts from the monastery and finishes at the famous sky burial site at 4564m. Drigung Thil Monastery has the best sky burial ceremony in Tibet. The legend has it that the souls buried here will not enter the “3 bad regions”. When you travel in the car in the region, you might see donkeys carrying bodies under a blanket. While not a sight for the faint-hearted, it will definitely be a very unique Tibetan cultural experience for the curious minds. The viewing of sky burial ceremony takes special planning due to the rules imposed by the monastery. As for accommodation, you can stay at the monastery’s basic guesthouse. There is also a shop selling food and drinks. If you want to visit Drigung Thil Monastery on your Tibetan trip, check out some Tibet tour options that cover this region.